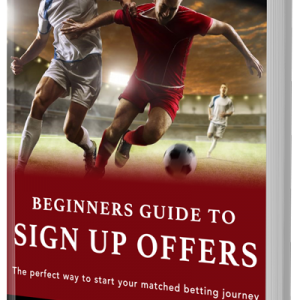 Matched and partially matched bets can be a confusing concept for matched betting beginners (and sometimes, for more experienced matched bettors too). In this article, we’ll explain and simplify this concept so you can easily understand what to do when you have matched or partially matched bets. As you’ve found this article, I’m sure you already know what matched betting is and why it’s so popular in 2018. It’s hands down the best way to make up to £1000 per month online, risk and tax free. Still unsure what matched betting is or you’ve never heard of it before? Check out our comprehensive guide for beginners. Before we come onto matched and partially matched bets, we need to look at the workings behind matched betting. If you think you’ve got this nailed you can move onto the next section. The main concept behind matched betting is backing and laying. This is the process that makes matched betting completely risk free. We never put any of our own money at risk. Back and lay betting would not be possible without the help of a betting exchange. As we mentioned above, betting exchanges are a vital component of backing and laying. Without them, there would be no matched betting, so we have a lot to thank them for. A betting exchange is an online marketplace where punters bet against each other. Betfair are an example you’ve probably heard of. Let’s have a look at each one of these in more detail. 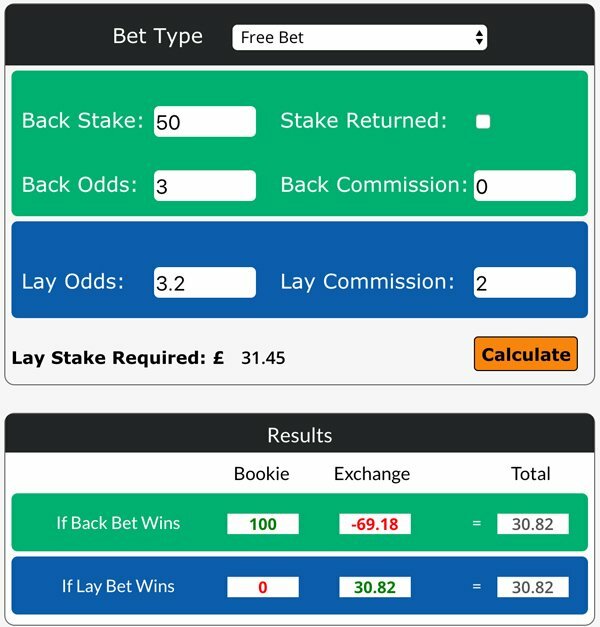 One of the main benefits of using a betting exchange is that you can place lay bets as well as back bets. If you’re new to betting, you’ve probably never heard of this kind of bet before. But it’s really quite simple. Note: In the second example the lay bet would win if the game was a draw as Leicester City would NOT win. This type of betting is not possible at traditional bookmakers which is what makes betting exchanges such a pivotal part of matched betting. Betting exchanges are based on a completely different business model to traditional bookmakers. They charge a commission on each players’ net winnings, whereas traditional bookmakers turn a profit by offering less efficient odds to the punter. This commission rate differs depending on which betting exchange you use. The lowest being 1.5% and the highest 5%. Fortunately, commission rates don’t have a significant impact on our matched betting profitability. The inherent benefits of the betting exchange business model mean they’re far more flexible than traditional sportsbooks and the punter has access to more valuable and efficient odds. A betting exchange is an online marketplace for betting on events. People log on to buy markets (back betting) and sell markets (lay betting). The betting exchange simply facilitates this process and takes a small cut for doing so. When you place a bet at your local high street store, you’re betting against the sportsbook, for example William Hill. If you win, they hand over the winnings. If they win, they take your original stake. It’s exactly the same at a betting exchange except you’re handing the money to another punter rather than the company. For a bet to be accepted at a betting exchange, there needs to be two parties, as we mentioned above. There needs to be a buyer and a seller. This is where liquidity comes in. To explain this we’ll use a simple analogy of a customer in a bakery. If you head down to your local bakery, you can only buy as much bread as the shop are selling. If they only have 2 loaves of bread, that’s all you can buy. It’s the same with betting at an exchange. You can only buy (back bet) as much as there is for sale and vice versa. Rather than quantity, liquidity is shown in monetary value at a betting exchange. This figure is shown under the odds for each market. In the Betfair example above, a punter can only stake £220 on the highlighted market. Any more and the bet wouldn’t be fully matched. Partially matched bets are something most matched bettors have come across. They can be quite intimidating, especially for beginners who are discovering them for the first time. However, there are a number of ways to deal with partially matched bets which we’ll look at below. What is a partially matched bet? A partially matched bet is an incomplete wager at a betting exchange. Only part of the total stake is accepted. Here’s an example to help explain. James placed a bet of £50 at odds of 3.0, however, only £30 of his total wager was matched. £20 of his bet is left unmatched. What causes a partially matched bet? There are two main reasons the situation above can occur. One reason is there isn’t enough money in the marketplace. This point comes back to liquidity, which we mentioned earlier. You can’t buy more than what’s available. In the example above, there was only £30 available for James to bet. Therefore the other £20 is currently unmatched. Popularity of an event. Less popular events have less liquidity and therefore less money waiting to be matched. Timing of your bets. If you’re placing your bets days before an event is kicking off, the likelihood is that few people will have entered the marketplace. The second reason your bets may be partially matched is due to a change in odds. It’s common for odds to change incredibly quickly in the run up to an event. In the time it takes you to place your back bet, the lay odds may have altered slightly. If you recognise this in time, you’ll be able to recalculate your lay stake accordingly using a matched betting calculator. If you don’t spot it, you may be looking at a partially matched bet and wondering what to do next. Partially matched bets leave a certain amount of a wager unmatched. If this unmatched part of the bet doesn’t get matched before the start of the event, it becomes lapsed. It hasn’t been placed. Note: The matched part of the bet will still stand. So if your lay bet goes on to win, only the matched part of the wager will count. The other unmatched section is voided. This can be daunting for matched bettors but there’s no need to panic. There are a number of solutions. As it stands, only the matched part of your wager will count. We need to change this so the whole stake counts. At this stage, it’s likely the odds have changed since you initially placed your lay bet. Before you start the process below, have a little patience and check to see if your bet will match. Typically, the odds before an event will start fluctuating up and down as people enter and leave the marketplace. Wait for a few minutes and you may get lucky and your bet will match at the original odds. If the odds are continually increasing or the event is kicking off soon (within 5 minutes), I would move straight on to the next section. The longer you hang around on this step, the more risk you run. I suggest beginners avoid doing this and jump straight to the next step. So the odds have changed and we need to work out the lay stake for the unmatched part of the bet. This is where the Advanced Lay Calculator from Trickybet comes in handy. => Step 1 – Cancel the unmatched part of your bet. If this part of the bet isn’t going to get matched, there’s no point having it. You can cancel your bet in the bet slip and you now have a partial lay. => Step 2 – Open the advanced calculator and enter all the same information you would for a normal bet. This includes the back bet information. On the right hand side, you’ll see the ‘Part lays already in place’ section. Here, add the lay bet that is already in place. Here’s an example to help explain. We’ll use a similar example to the one above where James wanted to place a £50 free bet with back odds of 3.0 and lay odds of 3.2. The calculator tells us his lay stake should be £31.45 with lay odds of 3.2. As James was in a hurry, he didn’t realise that the liquidity was only £20 for the market he selected. Therefore, this left him with a partially matched bet – a £20 bet at odds of 3.2 and an unmatched bet of £11.45. The lay odds have now changed to 4.0. So in the advanced calculator we add all the information plus the existing part lay. The calculator tells us our lay stake should be £9.15 at the new odds of 4.0. Once you’ve double checked everything, you can go ahead and place your bet at the exchange. As you can see, there’s quite a bit to solving partially matched bets. It takes some time to get used to. However, this process is definitely worth doing. Leaving a bet partially matched can lead to all sorts of problems and you may end up losing a lot of money. On some occasions, your whole bet may be unmatched at the betting exchange. This generally happens for the same reasons a partially matched bet occurs. Namely the lay odds change in the time between placing your back bet and lay bet or there isn’t enough liquidity in the marketplace. Either way, completely unmatched lay bets are easier to deal with than partially matched bets. Simply recalculate your lay stake using the new lay odds. As you can see, partially matched bets can cause unnecessary problems in matched betting. Use these tips below to avoid getting into any difficult situations. Place bets on markets with high liquidity. The more people that are in the marketplace, the better. Our bets are more likely to get matched straight away and placing bets on popular events also helps us blend in with the betting crowd more easily. Carrying on from the point above, use a popular betting exchange. I suggest you stick to one of the following exchanges; Betfair, Smarkets, Betdaq or Matchbook. Read our in depth comparison for more information. Time your matched bets sensibly. The later you leave a bet, the more likely the odds will start to fluctuate quickly, increasing the likelihood of a partially matched bet. In certain events like horse racing, the odds will fluctuate a lot about 5-10 minutes before the off. In other events like football, the odds are more stable. However, I still recommend you place your matched bets at least 10 minutes before the start of the event. As with everything in matched betting, double checking is very important. Check whether the market has enough liquidity before you place any bets and then make sure the lay odds haven’t altered in the time it takes you to place your back bet. Unmatched and partially matched bets can be rather annoying for matched bettors. However, you’re likely to come across them once or twice. When you do, use the process and tips in this article to help deal with them in the best way possible. It’s better to do something rather than just sit and hope your back bet will win! I hope this article has given you a better understanding of what matched and partially matched bets are. If you have any questions about this or anything matched betting related post a comment below or get in touch and one of the team will get back to you as soon as possible.